When it came time for Urban Meyer, head coach of the defending national champion Florida Gators, to offer some advice to his new quarterbacks coach on how to handle Heisman Trophy winning quarterback Tim Tebow, the message was pretty simple. "Coach Meyer said just don't screw him up," Scot Loeffler said. All well and good. But we know the real reason that Meyer brought in Loeffler: to help Tebow become more "NFL Ready." And Loeffler has some serious bona fides, including his years doing wonderful work with quarterbacks at the University of Michigan (like Chad Henne, Tom Brady, and Brian Griese), though his encore was spent this past season with the Detroit Lions just trying to teach his quarterbacks the simple things, like, you know, not running out of the back of the end zone for a safety to seal a loss. As I have previously written, Tebow needed to put "becoming a better pro prospect" at the head of his "To Do" list. And many -- including Tebow in the USA Today piece -- cited Loeffler's hiring as a reason he came back. But I'm not so sure that this is the perfect marriage. I mean, I think for Florida Gator fans even a slightly confused or tinkered with Tebow is better than the next guy, but what about for Tebow? Loeffler can definitely help in a few major areas: footwork (avoiding the famed and slightly ridiculous "spread quarterback" label); reading coverages; accuracy; and the ability to make a wider variety of throws than Florida asks him to. But again, as I said before, I'm not so sure that he wouldn't get all this and more actually in the pros. All he turns down is a set amount of money (but not a "fixed" amount because an increase in Tebow's draft stock is purely speculative), aside from of course, more college glory and the "college experience," which did not serve people like Matt Leinert all that well and Tebow has achieved all that is humanly possible in college. And I still think it ignores a big drawback for Tebow: all the hits he takes. He essentially takes hits like a runningback does, and the studies are voluminous showing that runners deteriorate, not so much over the course of a season, but at some point in their careers. So the real parties in interest, Florida and Urban Meyer, now must try to satisfy two masters: win games but also make Tebow more of a "pro-guy." Do you try to call fewer runs for him? Do you emphasize different points of the game? Do you take some of the (limited) time Loeffler gets to spend with him and dedicate that to pro-style stuff rather than the immediate gameplan? Don't get me wrong, Tebow becoming a better dropback passer can only help Florida, and Loeffler is a very good coach and is a great addition no matter what. But for Florida's sake I hope they don't fixate on this too much, and for Tebow's sake I hope he isn't expecting more focus on his pro prospects than might be appropriate. Time will tell. Tebow's a pro already. Heisman. Maxwell Club. National championship. The kid is smart to stay, no matter how much we are looking forward to seeing him play in the NFL. Back to School, FU...When you are a top QB, you go pro as soon as possible. 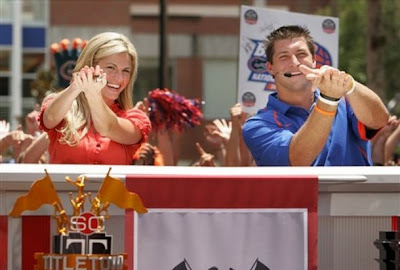 The on the job training is perfect for a guy like Tebow while likely getting "nickel QB" time. I wonder aloud why Urban Meyer concerns himself with preparing Tebow for the NFL - he doesn't get paid to do that. I wouldn't fault Meyer for doing all he can to prep Tebow for the NFL as a favor for all he has brought to UF, but a two-loss season and a Gator Bowl would be a failure in Gainesville now. Honestly I think the whole "Scott Loeffler has been brought just to make Tebow a Pro" bit is as much a smokescreen as it is anything else. Urban's real goal in hiring him is for him to mold John Brantley... someone who really will benefit from Loeffler's style and who has the job of filling the largest shoes any college player has ever left for his successor. That Loeffler is someone Tebow knows and trust and can help him some is just Urban's way of killing two birds with a single stone. I think you're dead on in your assessment. If he helps Tebow, that's great, but Brantley is the better pro prospect and will benefit much more than Tebow from Loeffler's coaching. I don't think Loeffler was brought to Michigan until the 2002 season. I don't think you can credit him with Greise and Brady, but I could be mistaken. Yup, he has the potential to be a new QB coach. He has the talent.